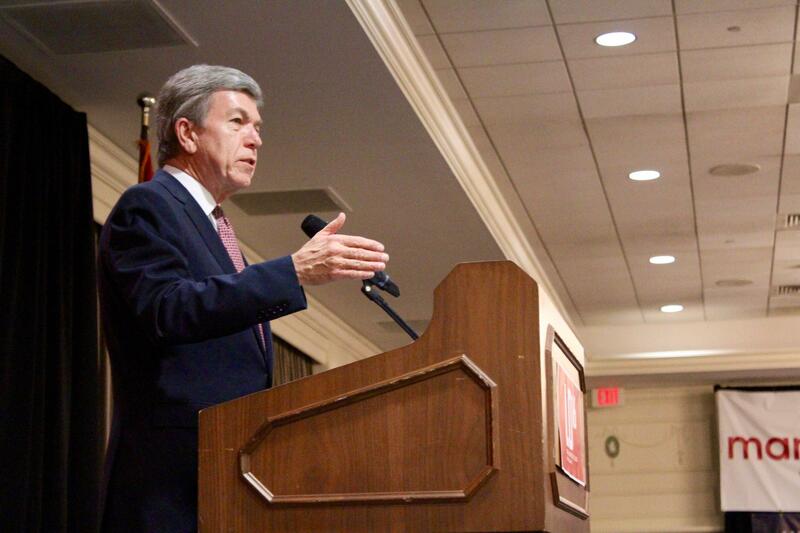 U.S. Sen. Roy Blunt speaks at Lincoln Days earlier this year. The two were battling for the GOP nomination for governor that year. Webster repeatedly denied he was under federal investigation, although it later was revealed that Webster had indeed been the target of such a probe. Webster narrowly defeated Blunt in the GOP primary, but lost in the general election and eventually ended up in prison. Jo Mannies describes the current Senate campaign. By 1996, Roy Blunt had won election to Congress from his home turf in southwest Missouri. He was elected to the Senate in 2010, handily defeating Democrat Robin Carnahan. His past is noteworthy now because Blunt has continued to portray himself as a reformer during his 20 years in Washington. Most of the time, his targets have been Democrats, who he claims are out of control. Blunt maintains that Democrats are responsible for over-regulation and too much government, which he says is hurting the state and the country. "What we see with these regulators is they pass some new regulation, they congratulate themselves, they go to lunch, end the day and don't have any idea of the real world or the real world impact." Abigail and Roy Blunt celebrate a victory in the 2010 primary election. 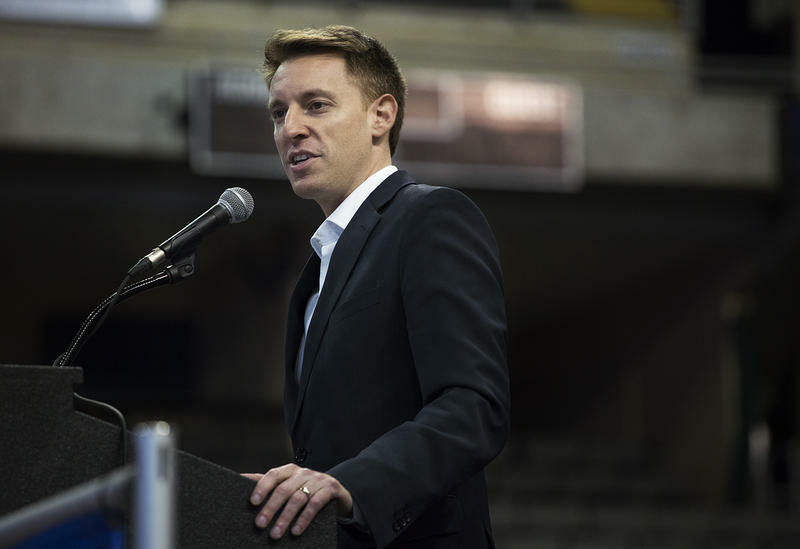 Jefferson County has become a key battleground in his battle against Democrat Jason Kander. (A Kander profile is also available.) He officially kicked off his re-election bid there last February, and has stopped by numerous times since. Republican activists say Jefferson County will be a bellwether in the Senate race, as well as other major statewide contests. Blunt, 66, is a familiar name and face in Missouri politics, going back 43 years. He was a history teacher when he was appointed in 1973 to be the Greene County clerk, a post he held for 12 years. Blunt made an unsuccessful bid for lieutenant governor in 1980. Four years later, he was elected Missouri secretary of state, a post he held for eight years. Blunt also has emphasized his humble roots. His parents ran a dairy farm, and his grandfather at one point worked as a janitor at the high school where Blunt got his first job after college. Kander’s campaign, bolstered by allied outside groups, is pounding hard at the theme that Blunt is no longer a reformer and working-class symbol, and instead is focused more on enriching himself and his family. Blunt’s campaign has emphasized that his wife, Abigail Blunt, does not lobby the Senate. As for his children, former Missouri Gov. Matt Blunt “runs an organization responsible for representing the domestic auto manufacturers,” the campaign said, while siblings Amy Blunt and Andy Blunt (who also heads his father’s campaign) are Jefferson City lawyers and do no work in Washington. Democrats point to reports that Andy Blunt has engaged in lobbying in DC. Blunt himself declines to discuss such jabs, although his campaign has countered with attacks at Kander and his wife. What really counts, Blunt says, is his record and how the Senate contest could affect the country. 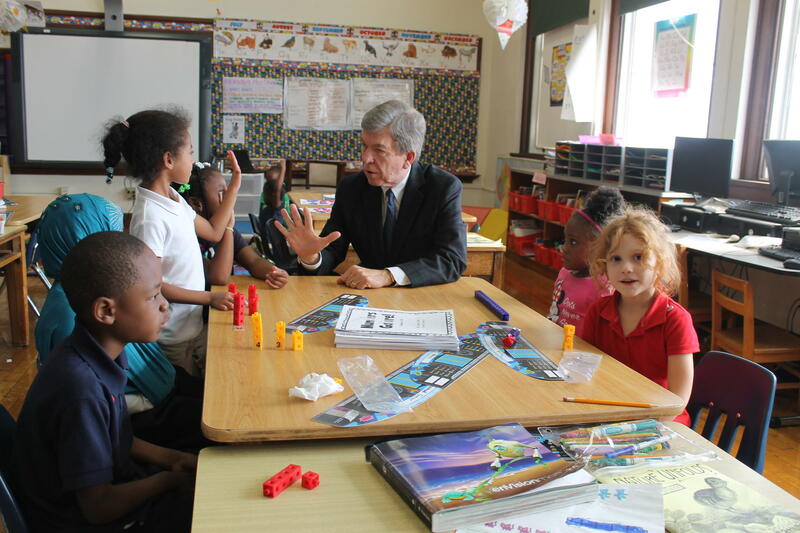 Blunt visited a St. Louis school in September to emphasize his support for education. “We ought to be talking about the rolling disaster that is Obamacare, what happens when the regulators regulate and don’t understand the job impact, how dangerous the world is with a foreign policy where our friends no longer trust us and our enemies are not afraid of us,” Blunt said in a recent interview. 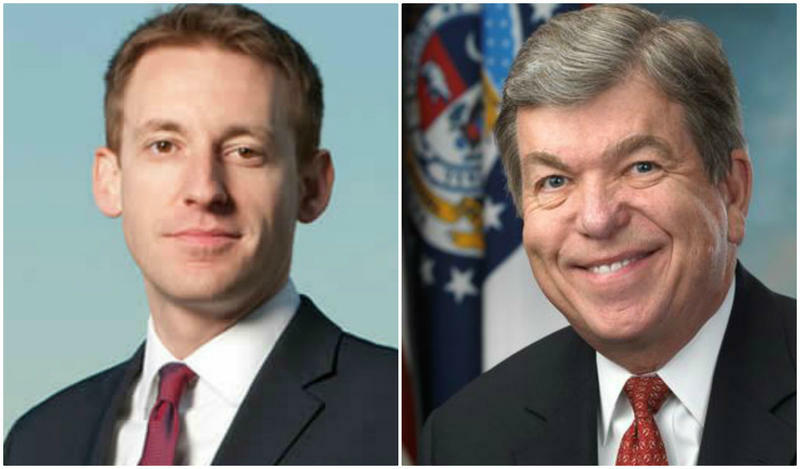 Blunt and Kander have both benefited from heavy spending — in the millions of dollars —by outside groups on their behalf. But federal law bars any coordination between those groups and congressional campaigns. The Missouri Democratic Party filed an FEC complaint this week alleging that Blunt called the head of the Susan B. Anthony List — an anti-abortion group that oversees an affiliated Super PAC — to ask the group to spend more money to aid his campaign. The state Democratic Party also has raised questions about a political action committee, Missourians for Responsible and Better Government, which was set up by Matt Blunt two years ago with just over $110,000 in his excess campaign money. The group’s treasurer is Jill Blunt, wife of Andy Blunt. Some of the money has been donated to Roy Blunt, at least $2,000 this year. (Other beneficiaries include GOP secretary of state nominee Jay Ashcroft, who has received $2,500). The Blunt campaign replied in a statement, "These false assertions have absolutely no merit whatsoever and are simply a last-ditch effort by the Kander campaign and Missouri Democrats to distract from the real issues Missourians care about in this race. The Blunt campaign and Roy Blunt scrupulously follow all campaign finance laws including restrictions on coordination with outside groups." The Missouri GOP and Blunt's campaign have, in turn, raised questions about Kander's campaign activities. 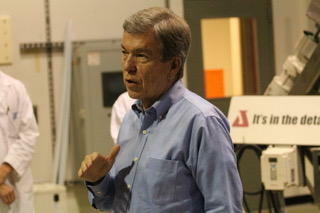 Roy Blunt has campaigned at many businesses throughout the state. Earlier this month, Blunt and Kander held dueling roundtables with St. Louis military veterans on the same day. The sessions focused on the same key issue —how best to address veterans’ needs — and highlighted the two campaigns’ emphasis on the issue. Kander focuses a great deal on his military service. And earlier this year, the campaign took a jab at Blunt for the college deferments he received during the Vietnam conflict. Blunt, 66, had made no secret of the deferments when he ran for governor in 1992 and noted that he was in the lottery pool for the draft when he graduated from college. He got a high number and was never called. In recent years, Blunt has been an outspoken critic of the VA and has proposed government help so that veterans could obtain medical care from private physicians and medical facilities. Former state Rep. Jack Jackson is a retired colonel in the Marine Corps Reserves. He also is co-chair of the group, Veterans for Blunt. Jackson notes that Blunt has served on the Senate Armed Services Committee and most recently on the Intelligence Committee. As the Senate race has gotten tighter, Blunt also has highlighted the outcome’s significance in determining who sits on the U.S. Supreme Court. 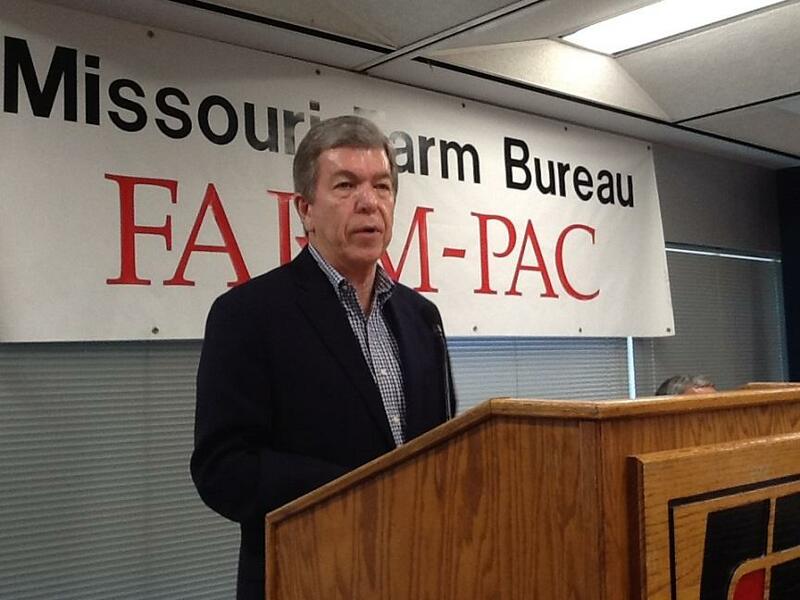 Republican U.S. Sen. Roy Blunt was endorsed by Farm Bureau members in February for a second term. Blunt is siding with GOP leaders who have declined to vote on President Barack Obama’s choice, Merrick Brian Garland to replace the late Antonin Scalia, who died last winter. At the only Blunt-Kander joint appearance, in late September, Kander jabbed Blunt for not at least meeting with Garland. Blunt, in turn, focused on the gravity of the current and possibly future vacancies on the nation’s highest court. “I think the next Senate and the next president will have an opportunity to reshape the court in a way that you probably won’t see for several presidencies,” Blunt said. He has maintained that his re-election could help guarantee that conservatives remain in control of the nation’s highest court. Blunt adds that he believes that’s what a majority of Missouri voters want. Republican presidential candidate Donald Trump has been warning his supporters for weeks that the 2016 election is rigged. It's a claim that Missouri Secretary of State Jason Kander calls "unfair" to local election authorities. The Illinois State Board of Election said in a statement that "allegations of a 'rigged' election are completely unfounded." Legal Roundtable: As Election 2016 approaches, how concerned should we be about voter fraud? 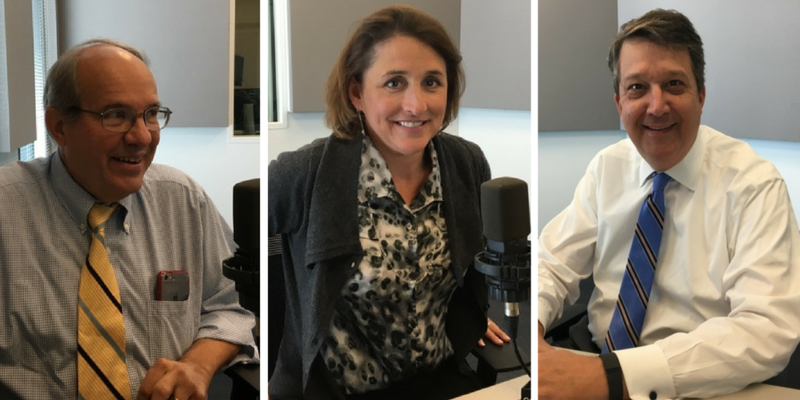 On Wednesday, St. Louis on the Air’s Legal Roundtable discussed pressing legal issues of the day, including voter fraud, voter photo I.D., the dismissal of a Ferguson excessive force suit, St. Louis’ minimum wage and the Supreme Court. Although candidate filing is about six weeks away, U.S. Sen. Roy Blunt and his Democratic opponent, Secretary of State Jason Kander, are already weathering repeated political attacks. Rather than focus on their campaigns, many of the criticisms are aimed at damaging their character by challenging how they are handling their offices. Republicans are faulting Kander for some of the findings in a recent state audit, which questions how he had handled staff raises and how his office had misfiled $120,000. Meanwhile, Democrats continue to jab at Blunt’s apparent increased use of charter planes, which cost taxpayers more than if he traveled by car.